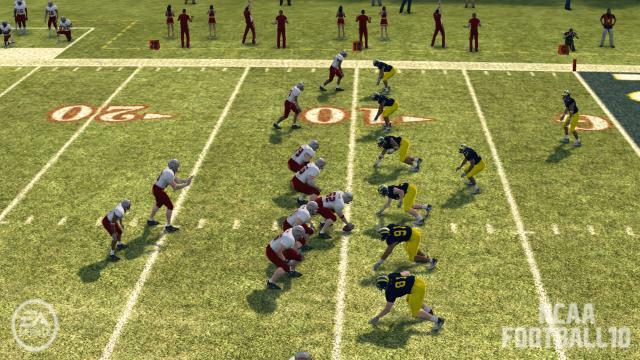 I know last week we were “meh” on the new EA NCAA offering. First glance was that it was OK, but that was pretty much it. But I heard more about this Teambuilder feature, where users can create all sorts of teams online and then you can download them into the game. And with that, the historical team possibilities are wide open. 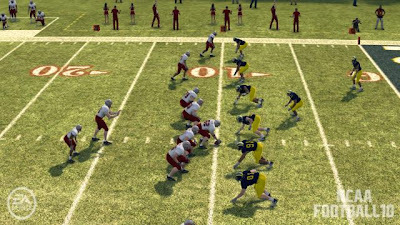 Sure enough, I did a search and found that there were some WSU teams that someone had made, complete with updated rosters, uniforms, the works. 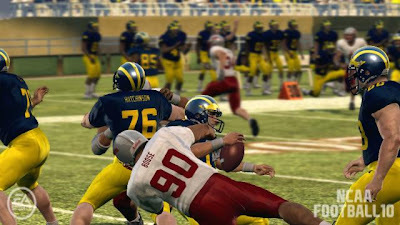 So I found the ’97 Cougs, and wondered if someone had made ’97 Michigan? Maybe it was time to replay that classic Rose Bowl? And what do you know, but ’97 Michigan was out there too. So I downloaded both teams and fired up a game. I won’t totally bore you with all the details, but Michigan won again. This time it went to OT, where they pulled out a 38-35 thriller. Leaf was strong, throwing for over 300 yards and three TD’s, but his lone INT came in the OT period to end the game. 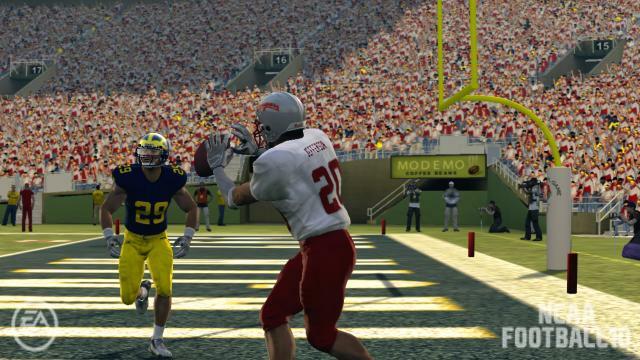 An INT that was snagged by none other than the virtual Charles Woodson, Heisman winner in that fateful year. Michael Black didn’t get hurt this time, but the Michigan D held him in check to just over 50 yards rushing. Click the read more feature to see a video replay of Leaf rolling out and hitting none other than LOVE JEFFERSON for a TD…. The footage is a little grainy, I know, but still you can see what’s going on. There are other WSU teams out there, such as the ’92 Bledsoe’s. I believe I found the ’02 Rose Bowl team as well, with Gesser, Derting, Trufant, Long, etc, but it looked like a work in progress at the time. I am going to try and search out ’91 UW, and see what that would look like to play ’97 WSU against them, two of the best Northwest PAC-10 teams of all-time. Anyway, with this Teambuilder feature alone, I would upgrade the recommendation to MUST BUY! Speaking of EA, poor Erin Andrews! Sure, she’s got a great life with a fantastic job and a rumored romance with Mets superstar David Wright. But I mean wow, we love her and all that, but a peep-hole video? How gross/scary is that? She’s a beautiful sideline reporter in a supercharged, testosterone-laden environment, but she’s still a human being. Nobody deserves to have that happen to them. And you wonder what her breaking point is going to be. Will something like this force her to just walk away from the whole thing? She has been interviewed before about dealing with that part of it, and she seems to have some pretty thick skin. Today the LA Times asks if it’s even possible to just let her do her job? This is crossing a line in every conceivable way. Oh, and don’t go searching for the video, one of the most popular searches via Google the last few days. Not only has it been pulled down from every possible site, but, it’s also being used to spread a pretty nasty virus. Hopefully they catch the perv and sue the hell out of him. Finally, some recruiting news hit the web yesterday. First, Nico Grasu’s brother, Hronnis Grasu, a three-star defensive end from Encino, pledged to Chip Kelly and Oregon. BOO. I guess the lure of his brother in Pullman just wasn’t enough. WSU, UW and UCLA were the other PAC-10 teams on his list. There was some good news though. A corner/running back named Brandon Golden committed to WSU last night. Hailing from Covina, CA, Scout.com reports he is 6-0, 180, and runs a 4.4 in the 40. Not much else is out there, other than he was first team all-league choice at running back last year, and well-rounded enough that he also led the area in interceptions last season. He’s already mentioned as a likely first-teamer as a DB in ’09. The Cougfan ($) article mentions that he was so taken with the WSU coaches that he committed without even taking his trip to Pullman! Now, it’s July, and a loooooong way until signing day. Now that he’s got a verbal commit in his pocket to a PAC-10 team, well, if he wasn’t on the radar with other coaches before, he sure is now. We know all too well that a lot can happen between now and February. All for now. As always, GET IN A FIGHT FOR WASHINGTON STATE(or something like that!). You are currently browsing the archives for the NCAA Football 10 category.